Some time ago, I needed a "timer" to represent the passing of time on a puzzle, and I found that the GUI "progress bar" was ideal for the job. For a long while I wrestled with how I might be able to use this as means to present the HP Bar often associated in many RPG games that NWN2 lacked. This GUI has been successfully used to represent one creatures HPs (like a Boss Creature), but I wanted to have a system that would "hover" over all hostile creatures in a combat, and I could see no way of making it work. Note, NWN2 does provide some feedback in a small GUI for a targeted enemy at the top of the screen, but I always found this hard to see (due to being colour blind), and I did not like having to keep switching targets to get an update. The answer, as it occurred to me, was to apply a VFX (visual effect) to the creatures, that would hover above their heads, in much the same way spell effects show on creatures. PC attacked by a pair of wolves with feat enabled. A closer shot of the Hit Point bars over the creatures heads. The trick to overcome was, of course, having the bar update as the creatures HPs went up or down. The answer was to simply have many versions of the same VFX showing different percentages of HPs remaining and removing/applying the correct VFX as required. Make the VFX permanent until I wanted it removed, and this problem was solved. The last thing I wanted to address was how I would introduce it into the game, as I recognised that not everybody may welcome this addition. The answer was to have the player learn this as a "feat" called "Observe Condition" (if they wanted it), which they could then add to a hotbar and toggle its effect on or off as desired. Additional Note: I am also considering adding a "Boss Bar Visible" option on the Althéa Main Menu, which would complement these dynamic bars. This option could be toggled alongside the system above, allowing multiple options for the player. When playing a NWN2 game, I talk to a store vendor and ask them to show me what they have for sale. In the standard game, I would then have to right click and choose "Examine" on each item for sale to open a new menu where I can read about the item in question ... and if I want to read about the item I am comparing it to, I would have to do the same thing for that too from my PC's inventory. Basically, comparing items is not "easy" using the standard NWN2 interface, and for those who like to have it more simple, then this might be the answer. Now, when a player opens their PC's inventory, an "examine" window is already incorporated into it, which shows the description of any item they click on within their inventory. Additional Note: Items "examined" in containers will also open up the "inventory" screen and display item text in this same window. However, I suspect most players will simply click the "Loot All" option while playing and then "examine" the items in the inventory anyway. PC has started interaction with a store. 1) Information on options available and activity update here. 2) On first open, reminder instructions on inventory use. 4) Note, empty categories are made unavailable. This updates dynamically. 5) The best PC for bartering is automatically selected when store first opens. When interacting with a store, players will notice a new complementary store interface as well. Like the new inventory, the store interface also comes with a built in "examine" window that displays information about an item the player may be interested in purchasing for their PC. 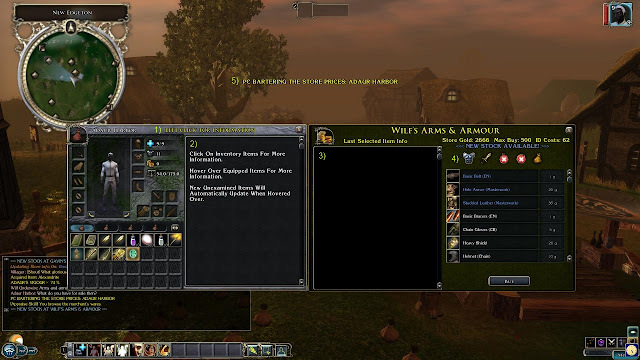 Note that the inventory item window and the store item window work independently of each other, meaning the player can click on items between those carried by their PC and those in the store, and each item will display in its appropriate window. Additional Note: If a player clicks on an item in the store, which their PC currently has an equivalent equipped, then the PC's item inventory screen will update to show the equivalent being used to enable a direct comparison of items. The PC is comparing their currently equipped armour with a selection from the store. 1) Notice the text informing you are comparing items. 2) The PC's currently equipped armour. 3) The armour that the PC is considering purchasing from the store. The PC does not yet have a helm equipped to allow a direct comparison. Buy one? 1) Information on item update. 2) The PC does not wear any helmet to compare. 3) Details on the helmet being looked at in the store. 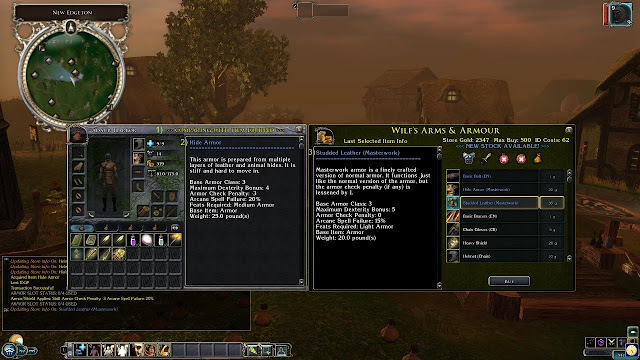 1) Having the inventory screen display another window if comparing an item in the inventory slots to one the PC may already have equipped. Pro: Another direct comparison option. Con: Another window on the screen. 2) New Addition: Have a transparent "Quest" header GUI that has a list of active quests (perhaps the quest title only), which the player can toggle into/out of the side of the main screen as a basic reminder of the options they have available to them. Pro: Nice reminder. Con: Not really required? I have enjoyed the break from writing the conversations, but now this section is nearly done, I will have to return to them. However, there was one other GUI I am working on to do with the introduction of the game. That will have to wait for another post though! Please give any feedback that you think may be of use to improve these game feedbacks, or if you have any ideas of other interface changes (or new) that may be of help to your gaming experience.